2Nevin, RL. 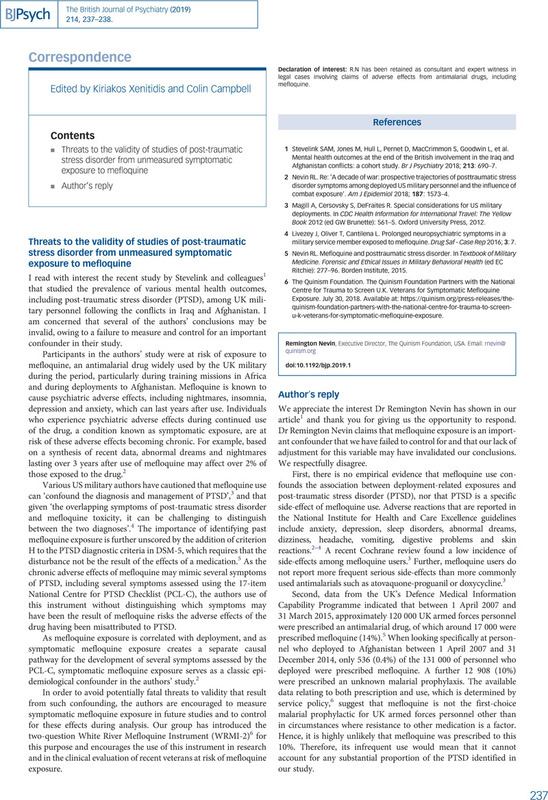 Re: ‘A decade of war: prospective trajectories of posttraumatic stress disorder symptoms among deployed US military personnel and the influence of combat exposure’. Am J Epidemiol 2018; 187: 1573–4. 3Magill, A, Cersovsky, S, DeFraites, R. Special considerations for US military deployments. In CDC Health Information for International Travel: The Yellow Book 2012 (ed Brunette, GW): 561–5. Oxford University Press, 2012. 4Livezey, J, Oliver, T, Cantilena, L. Prolonged neuropsychiatric symptoms in a military service member exposed to mefloquine. Drug Saf - Case Rep 2016; 3: 7. 5Nevin, RL. Mefloquine and posttraumatic stress disorder. In Textbook of Military Medicine. Forensic and Ethical Issues in Military Behavioral Health (ed Ritchie, EC): 277–96. Borden Institute, 2015. 6The Quinism Foundation. The Quinism Foundation Partners with the National Centre for Trauma to Screen U.K. Veterans for Symptomatic Mefloquine Exposure. July 30, 2018. Available at: https://quinism.org/press-releases/the-quinism-foundation-partners-with-the-national-centre-for-trauma-to-screen-u-k-veterans-for-symptomatic-mefloquine-exposure.